Nothing rings in the holidays like a favorite carol, hymn, or off-key sing-along with good friends. Artist Jessica Labowski creates a nifty new spin on this timeless element of the holiday season. 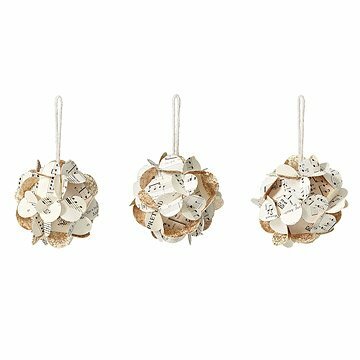 Using reclaimed vintage sheet music, these ornaments are great for the music lover in all of us. Whether you hang them from the tree, the ceiling, or even the doorknob, these festive little ornaments fuse together the worlds of handmade crafts and vintage decorations. Each set of three uses different reclaimed sheet music, so each one is unique and can strike chords of holiday cheer in the hearts of instrumentalists, educators, and music enthusiasts. Each set of three ornaments is handmade in Connecticut. Please note that the music scores used are vintage. Each piece reflects the historically rich pages and are one of a kind, so there will be variances in paper content and placement. Some pages may have more yellowing than others, but the artist does their best to use only the best pages as her materials. These are beautiful ornaments. They are bigger then I thought they would be, about the size of a tennis ball. They are a gift for my mom for Christmas so she hasn't seen them yet, but I know she will love them. Quite unique and a great present for our worship leaders at church. I only wish they were sold singly or boxed individually for better presentation to split up the order of three. I like getting the artist information but it was more generic than the history of how this particular item was made (out of antique hymnal pages, etc.) I like the concept and shape but would have liked to see more of the song or knew more about it for my recipients. The size is a good size for most anyone and I'm sure they will be appreciated. Upcycled sheet music decorations that are perfect for your favorite musician, handmade by Jessica Labowski in the USA.